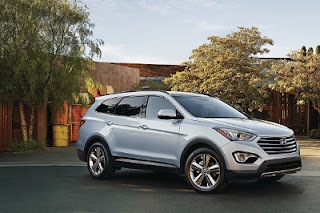 Gary Rome Hyundai Dealer Blog - A Gary Rome Hyundai Site (888) 637-4279: 2016 Hyundai Santa Fe Named "Full-Size CUV Of Texas"
2016 Hyundai Santa Fe Named "Full-Size CUV Of Texas"
"We are delighted to hear that the Texas Auto Writers Association recognized the 2016 Hyundai Santa Fe as the top contender in a highly competitive category," said Mike O'Brien, vice president, Corporate and Product Planning, Hyundai Motor America. "This is a tremendous honor that further confirms Hyundai's commitment to quality, durability, safety and comfort in this important product category." This win complements the Santa Fe's victory as CUV of Texas in 2013 and as Compact CUV of Texas in 2012 for its smaller, 5-passenger sibling Santa Fe Sport. During the 2015 Texas Truck Rodeo, more than 70 TAWA members evaluated some of the industry's leading trucks, SUVs and crossover utilities. In order to put each vehicle through its paces, the famed Knibbe Ranch in Spring Branch, Texas served as the event's proving grounds. With driving surfaces including bumpy pavement, loose gravel, slick mud, steep hills, jagged rocks and water crossings, each candidate stayed busy throughout the two days of testing. "The 2016 Hyundai Santa Fe earns our award for the Full-size Crossover Utility Vehicle of Texas - it delivers on comfort, functionality and reliability," said Michael Marrs, president of TAWA. "Once again, Hyundai has exceeded expectations in the segment to receive this award among an outstanding group of competitors." The Hyundai Santa Fe topped tough competitors such as the Honda Pilot and the Nissan Pathfinder. Aspects from exterior styling to road manners as well as pricing, fuel mileage, and off-road capability were all taken into account during the evaluation. Voting was conducted anonymously via electronic ballots. The 2016 Santa Fe continues to pack a healthy list of standard features, available premium convenience and entertainment items, while sporting simplified interior offerings. Available in front- or all-wheel drive, the 2016 Santa Fe is powered by the acclaimed 3.3-liter Lambda II V-6, using gasoline direct injection and Dual Continuously Variable Valve Timing (D-CVVT). An upgraded electric power steering system and suspension further sharpen the Santa Fe's world-class ride and handling. The 2016 model also comes standard with remote keyless entry with alarm, body color heated exterior power mirrors with driver's blind spot mirror, LED headlight accents, steering wheel mounted audio and cruise control and Bluetooth hands-free phone system at a starting base price of$30,400. HYUNDAI MOTOR AMERICA Hyundai Motor America, headquartered in Fountain Valley, Calif., is a subsidiary of Hyundai Motor Co. of Korea. Hyundai vehicles are distributed throughout the United States by Hyundai Motor America and are sold and serviced through more than 830 dealerships nationwide. All Hyundai vehicles sold in the U.S. are covered by the Hyundai Assurance program, which includes the 5-year/60,000-mile fully transferable new vehicle limited warranty, Hyundai's 10-year/100,000-mile powertrain limited warranty and five years of complimentary Roadside Assistance. Hyundai Blue Link Connected Care provides owners of Hyundai models equipped with the Blue Link telematics system with proactive safety and car care services complimentary for one year with enrollment. These services include Automatic Collision Notification, Enhanced Roadside Assistance, Vehicle Diagnostic Alert, Monthly Vehicle Health Report and in-vehicle service scheduling.